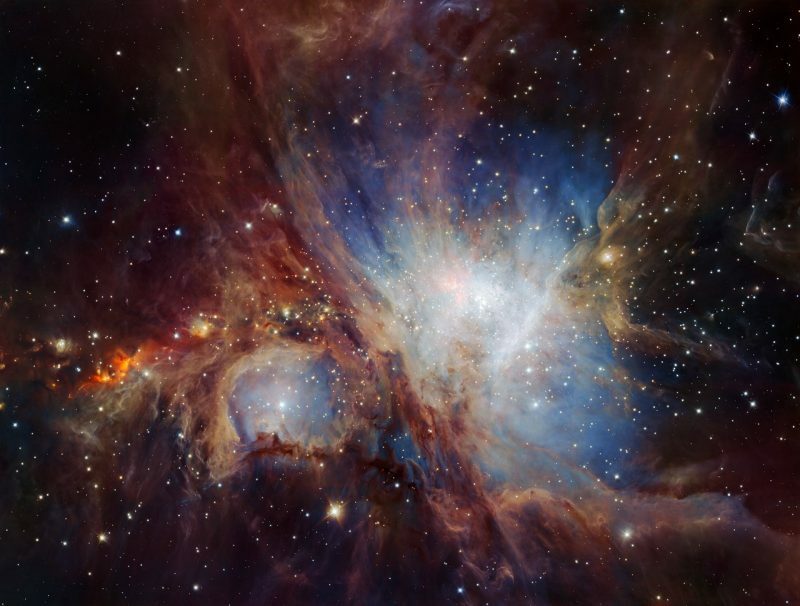 Everything you need to know about the Orion Nebula. 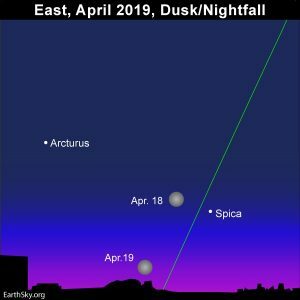 How to find it in your sky tonight. Plus … the science of this star factory in space. View larger. 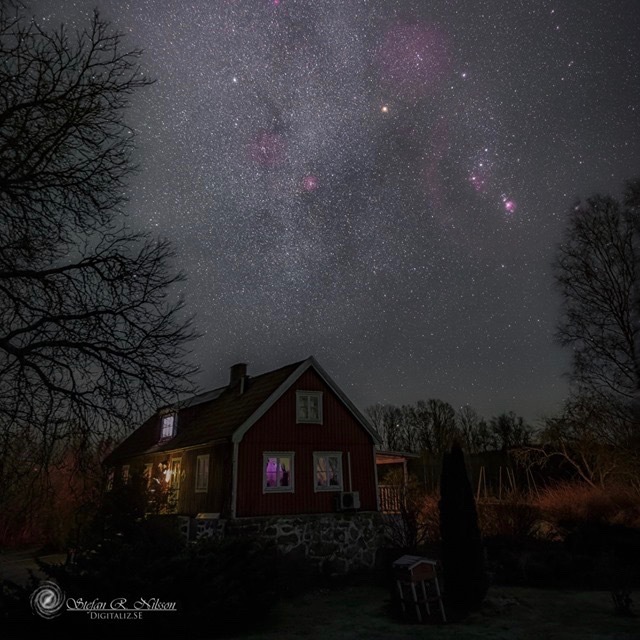 | Stefan Nilsson captured this image in southern Sweden on January 2, 2017. You can recognize the constellation Orion by his three Belt stars, three stars in a short, straight row. The Orion Nebula is that red fuzzy region in Orion’s Sword, hanging from the Belt. Many people are familiar with Orion, the most noticeable of all constellations. The three stars of Orion’s Belt jump out at you midway between Orion’s two brightest stars, Betelgeuse and Rigel, which are two of the brightest stars in the sky. Once you find the Belt stars, you can also locate the Orion Nebula, otherwise known as M42, a stellar nursery where new stars are being born. Follow the links below to learn more about the Orion Nebula. How to locate the Orion Nebula. 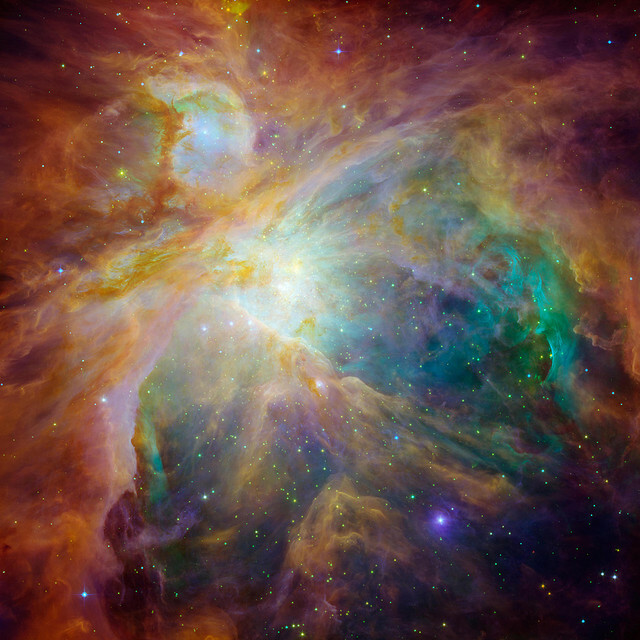 What science says about the Orion Nebula. View larger. | The three medium-bright stars in a short, straight row represent Orion’s Belt. A curved line of stars extending from the Belt represents Orion’s Sword. 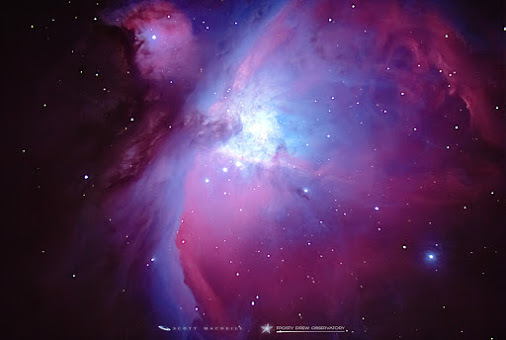 The Orion Nebula lies about midway down in the Sword of Orion. Image via Marian McGaffney. Orion Nebula captured on February 5, 2016, by Scott MacNeill at Frosty Drew Observatory in Charlestown, Rhode Island. Scott said this image is a composite of 25 shots. How to locate the Orion Nebula. If you want to find this famous nebula, first you have to locate the constellation Orion. Fortunately, that’s easy, if you’re looking at the right time of year. The Northern Hemisphere winter months (Southern Hemisphere summer months) are the perfect time to come to know Orion. 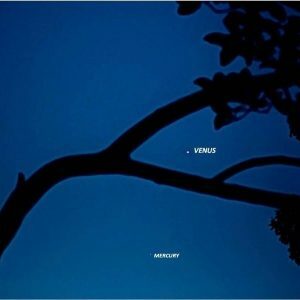 The constellation is noticeable for three medium-bright stars in a short, straight row. These stars represent Orion’s Belt. If you look closely, you’ll notice a curved line of stars “hanging” from the three Belt stars. These stars represent Orion’s Sword. Look for the Orion Nebula about midway down in the Sword of Orion. As a general rule, the higher the constellation Orion is in the sky, the easier it is to see the Orion Nebula. From Northern Hemisphere locations, Orion is due south and highest in the sky around midnight in middle December. The stars return to the same place in the sky some 4 minutes earlier each night, or 2 hours earlier each month. So look for Orion to be highest up around 10 p.m. in mid-January and 8 p.m. in mid-February. Another time people notice Orion is around the months of August and September, when this constellation appears in the east before dawn. … angel’s breath against a frosted sky. 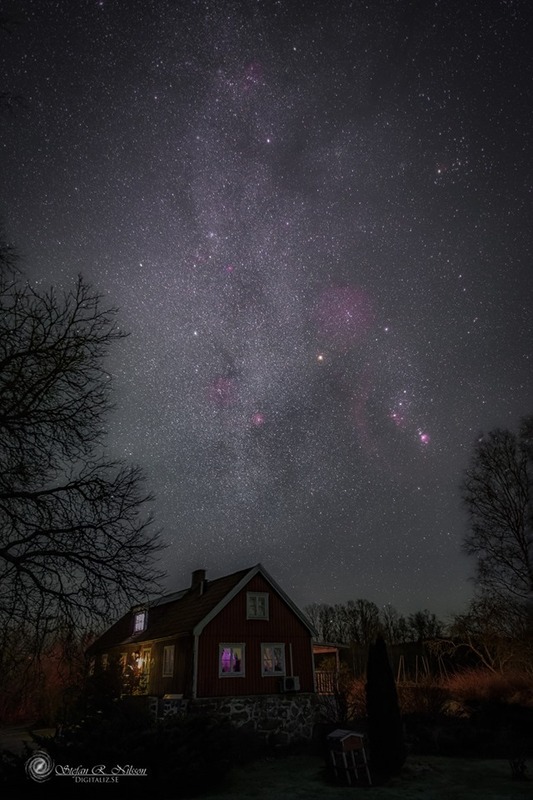 In a dark country sky, observe the Orion Nebula for yourself to see what it looks like. A backyard telescope, or even binoculars, do wonders to showcase one of the greatest celestial treasures in the winter sky. This spectacular image of the Orion Nebula star-formation region was obtained from multiple exposures using the HAWK-I infrared camera on ESO’s Very Large Telescope in Chile. Image via ESO/H. Drass et al. What science says about the Orion Nebula. According to modern astronomers, the Orion Nebula is an enormous cloud of gas and dust, one of many in our Milky Way galaxy. It lies roughly 1,300 light-years from Earth. At some 30 to 40 light-years in diameter, this great big nebulous cocoon is giving birth to perhaps a thousand stars. A young open star cluster, whose stars were born at the same time from a portion of the nebula and are still loosely bound by gravity, can be seen within the nebula. It is sometimes called the Orion Nebula Star Cluster. In 2012, an international team of astronomers suggested this cluster in the Orion Nebula might have a black hole at its heart. 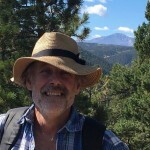 The four brightest stars in the Orion Nebula can be seen through amateur astronomers’ telescopes and are affectionately known as The Trapezium. The light of the young, hot Trapezium stars illuminate the Orion Nebula. These stars are only a million or so years old – babies on the scale of star lifetimes. But most of the stars in this emerging cluster are veiled behind the Orion Nebula itself, the great stellar nursery in Orion’s Sword. 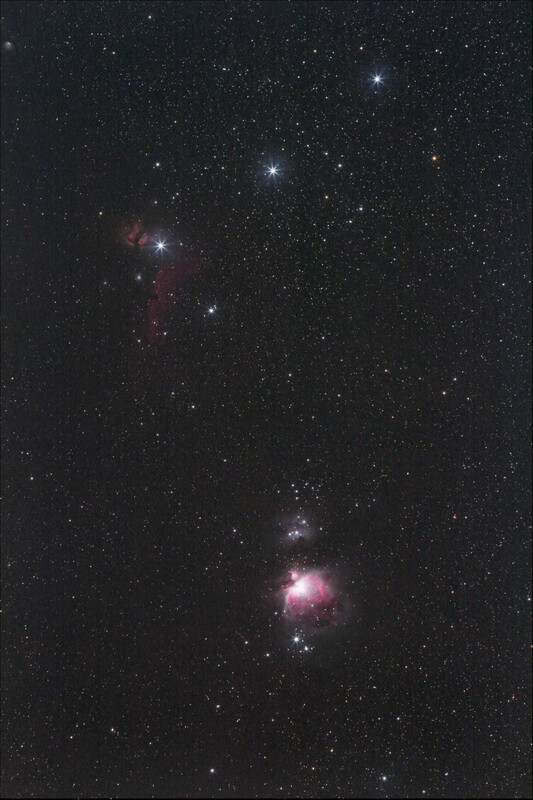 Bottom line: To find the Orion Nebula in your night sky, look below Orion’s Belt. Your eye sees it as a tiny, hazy spot, but it’s a vast region of star formation.